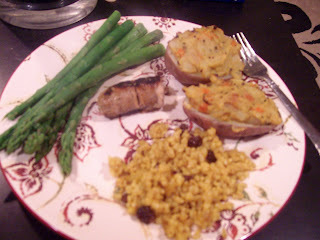 Here we are with another meal recap - yum! Lots of great food this week. I tried to take more pictures and I think that pictures will be an important part of the meal recap going forward! I also included some lunch pictures when they were particularly yummy! I loved these potatoes! I'm definitely going to be making them for my family Easter dinner next weekend. Joey and our dinner guest also enjoyed them as well. Originally Joey was not supposed to be in town for the first couple days of the week so I had planned some simple things to cook for myself while he was away. When plans changed and he stayed home, I sort of scrambled to pull together some dinners that had a little more substance! I found these sausages at the back of my freezer and helped myself to a tiny piece to enjoy with my meal. 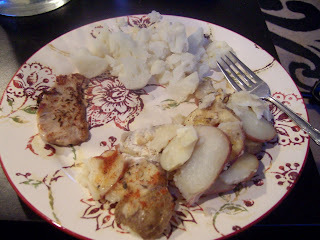 The potatoes were amazing!! I really encourage everyone to pick up Veganomican and make some of the recipes. Everything has been great so far. The spice in the potatoes were awesome and they were incredibly filling, so I only needed to eat one of the two halves that I had on my plate! Below is a picture of me trying to feed asparagus to our cat Eric. 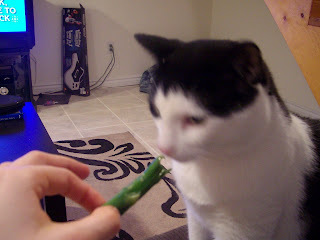 He wasn't interested in this awesome green vegetable - what was he thinking?? This salad was AMAZING!! 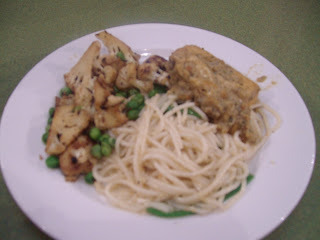 I used the marinated tofu recipe from reFresh as well and everything worked so well together. Tofu is here to stay! 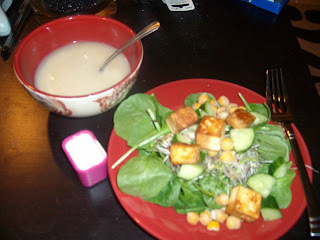 I also made the sunflower seed dressing from reFresh, which I absolutely love!! It was an awesome meal and I definitely enjoyed this salad for lunch over the next couple days. The soup was from a carton - can't remember the brand but it was organic and yummy. On Thursday Joey and I decided to abandon our dinner plans at home in favor of a date night! I was trying to figure out a place where I could have some choices (but Joey would still like) and I remembered Sweet Lulu. 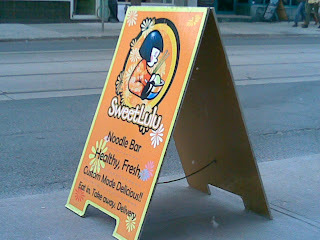 I had been there once before and after scoping out the menu online I decided it would be a great option for me. The staff were incredibly accommodating with my gluten free, dairy free needs. Our waiter was able to tell us which items were gluten free and dairy free or where they could accommodate these requests. 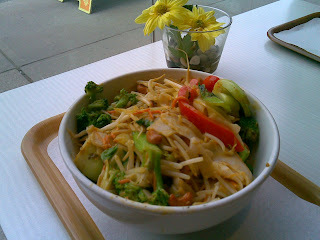 I decided on vegetarian rice noodles with malay sauce, cashews and ginger. The waiter even came back to our table to inquire whether I wanted egg included or not. My meal was incredibly yummy and I was definitely not able to finish even half of it! (Joey helped me out with that after he finished his chicken noodles with Thai chili) I'm really happy to know that this place exists and that they can accommodate my dietary needs easily. We finished off our date night with Coraline in 3D. Quite an experience. I really recommend it. This turned out so well! 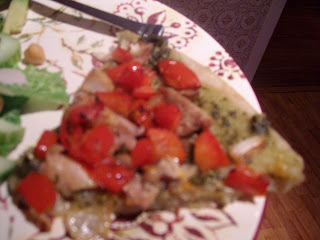 I used a pre-made gluten free crust from Nature's Own Bakery, Sunflower Kitchen pesto, with sauteed chicken, onion and red pepper. I added cheese on one side for Joey and it was delicious! I have to say that I didn't really miss the cheese! Everything else had so much flavor and my side salad was great (romaine, cucumbers, avocado, chickpeas, sunflower seeds & currants with sunflower seed dressing) so it really felt like a complete meal. Despite being gluten free, Joey said that he really enjoyed it as well! 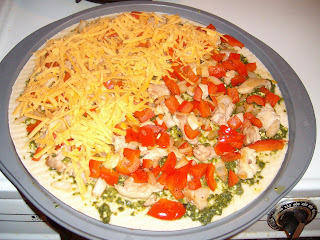 I will definitely be making pizza again. On Saturday afternoon I had a great day of walking (6km!) and shopping with my dear friend Jess. We stopped in at the Big Carrot for lunch where I had roasted cauliflower, tofu and brown rice noodles with sugar snap peas. It was amazing! I love that all the items in the take away counter have all their ingredients listed, so it's easy for me to see what I can and cannot it. It's reasonably priced (this plate cost me just over $7) and there are tonnes of gluten free, dairy free options.